Amazon opened a 5800 square foot store at Legacy Place in Dedham. 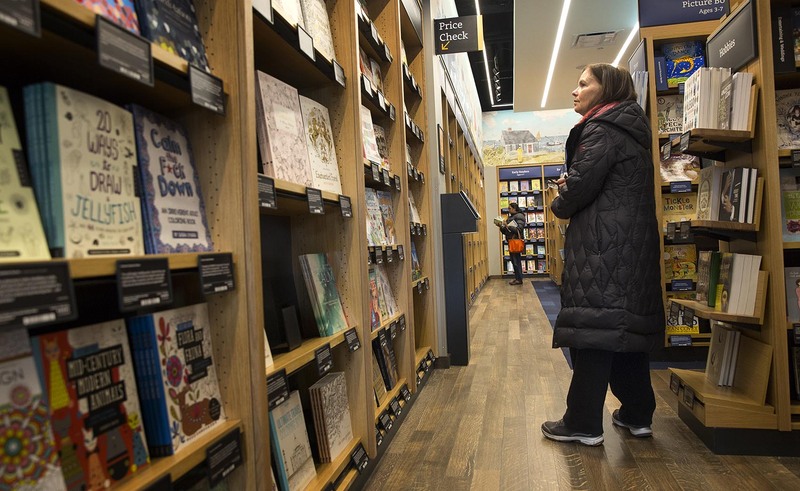 Amazon's First East Coast Bookstore Opens In Mass. Amazon now has a brick-and-mortar bookstore in Massachusetts. The online retailer opened a 5,800 square foot store Tuesday at Legacy Place in Dedham — the company's first bookstore on the East Coast. The Massachusetts store joins Amazon's three other locations on the West Coast. The store looks like a typical bookstore. It has everything from children's books to fiction to books about food and sports. There's also a coffee shop. On opening day, a steady stream of customers wandered in to browse the shelves or grab coffee. 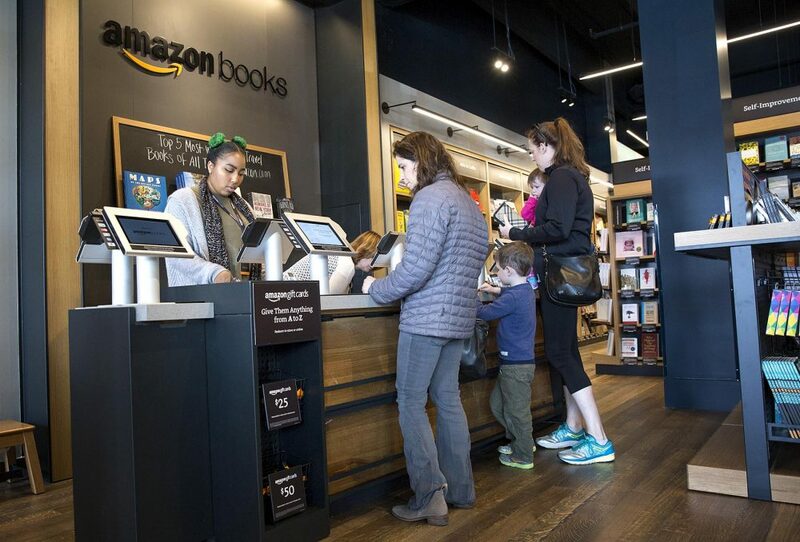 Amazon spokeswoman Deborah Bass said the store is really an extension of the company's online business, and offers a bit of that experience to help customers discover new books in person. "Beneath every book is a review card, where we include a little bit more information with some of those things that you're familiar with at Amazon.com," Bass said. "So, each book includes a review from a customer and it also shares the star rating. And all of the books featured in this store are four stars and above out of five stars." The store's selection of about 5,700 books is based on browsing and buying data from Amazon's website, including customer reviews and pre-order sales, as well as what's popular on Goodreads, an Amazon-owned book review site. At the store, customers can also try out Kindles and other Amazon devices they might want to buy. That part of the store was very appealing to Michael O'Brien of Winchester, who described himself as "technology challenged." He said he likes that he could browse the devices and get help setting them up. "To have them have it here is good because you're able to get their products in the store versus going through a computer and having to wait. So it's pretty cool," O'Brien said. But it's the feel of a bookstore and being able to walk up and down aisles of books that many customers were excited about on Tuesday. "I'm very excited. 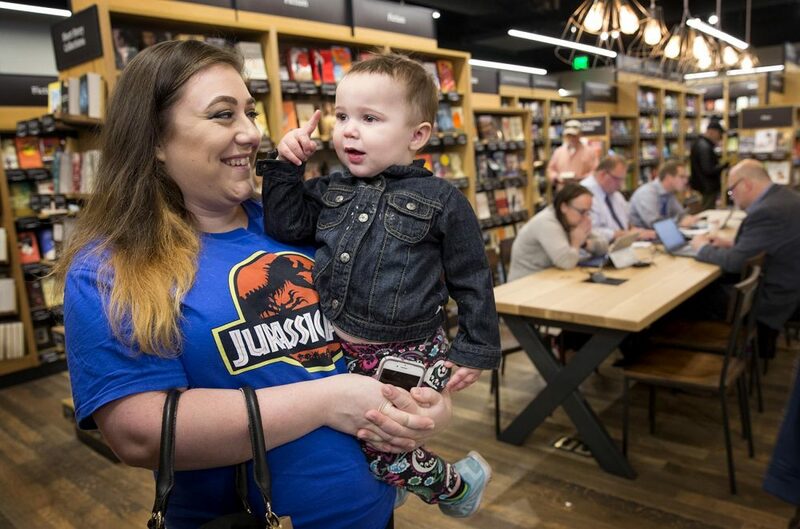 I love bookstores," said 23-year-old Samantha Lupoli, who works at Legacy Place and stopped by Amazon Books with her niece. "I love coming to a bookstore and getting a coffee and being able to sit down and have like an hour to myself and just read. I love it." Lupoli said Amazon is likely tapping into the desires of people like her who miss being able to go to a Borders. "While it is convenient to do it online, especially when you have little ones," she said. "Like I know my 8-year-old niece, she loves going and picking out books in a bookstore, and it's not as fun swiping on a screen to find your book. It's more fun to run and have something tangible that you can grab and just run home with." The idea of being able to just run home with a book is exactly what Amazon hopes to offer in its bookstore. But the online retailer — which started out by selling only books — has been the major reason that many traditional brick-and-mortar bookstores have struggled — and even shut down. As many people started going online to buy books, major book retailer Borders went out of business, while Barnes & Noble has closed stores over the years. Independent bookstores have also struggled to stay open. 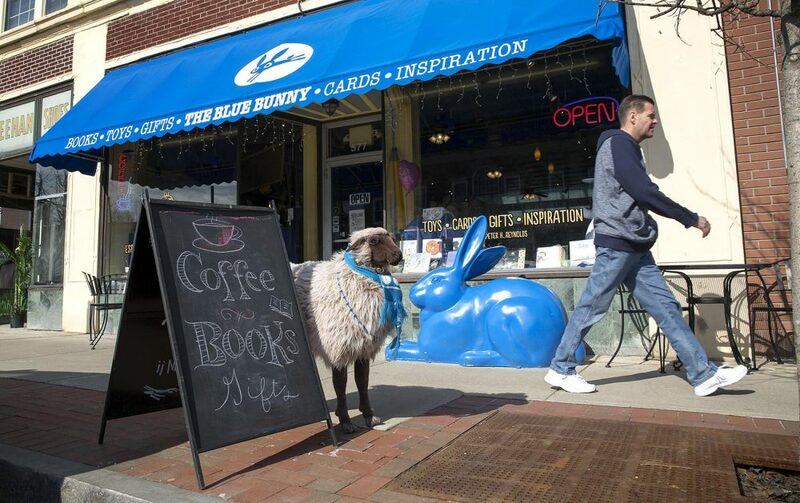 Just about a mile up the road from the new Legacy Place bookstore is Blue Bunny Books, an independent bookstore that specializes in children's books. 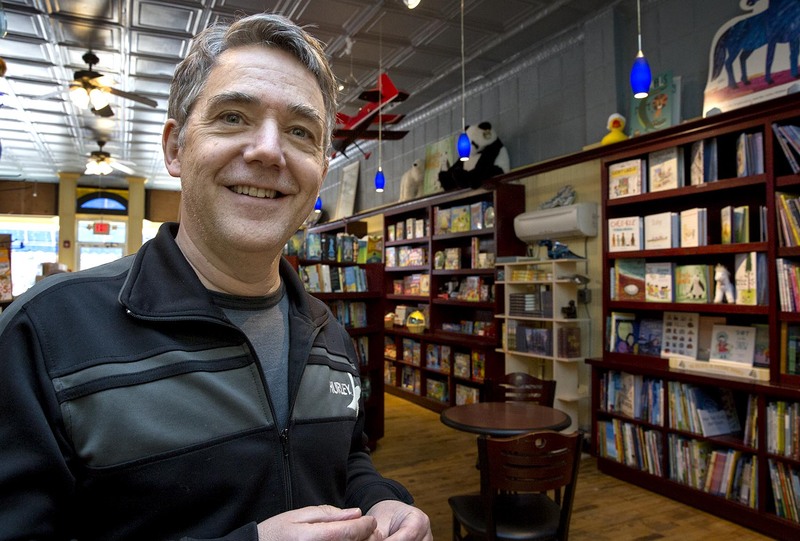 Store owner Peter H. Reynolds, a children's book author, said he was a little worried when he heard Amazon was moving into town. "Oh yes. The minute that the news came out I got hundreds of emails from friends and fans across the country and the world saying, 'Hey we just heard Amazon is moving up the street,' " Reynolds said. "And at first my heart sort of sunk a bit, but I realized quickly the response from our friends was what you have in your independent bookstore is very, very different than what Amazon is providing and I think that we're going to be OK."
Blue Bunny Books has been around for about 14 years and also offers online sales and a coffee shop in store. Ellen Modi of Westwood, who stopped in to grab a drink, said she plans to keep coming to the store because she likes bringing her two young daughters to book signings. "They have nice events with authors, and it's just personal," Modi said. "There's something to be said about all these small businesses that are disappearing because all these bigger things are kind of taking over." Reynolds said his store is often a gathering place for the community and he hopes that unique atmosphere will keep customers coming to independent bookstores like his. Meanwhile, Amazon hopes putting the best of online shopping on the ground helps it develop its own special and unique bookstore. The company also plans to open another bookstore in Lynnfield later this year, and more locations in California, Illinois, New York and New Jersey. Zeninjor Enwemeka is a digital reporter, covering a range of news. 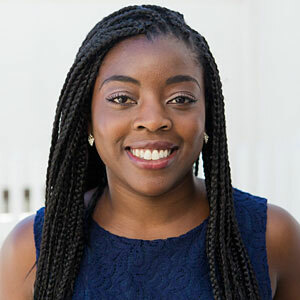 She also covers tech and culture as part of WBUR's Bostonomix team, which focuses on the innovation economy.